I welcome 2011 with a great deal of optimism and excitement. Today marks a new beginning for our company, our team and for me personally. Thirteen years ago we founded Gemba Research with the goal of doing something significant towards expanding the understanding of kaizen, the Toyota Production System and what we have come to call lean. We set out to become the best global TPS consultancy. We have not achieved that yet but this focus helped us make decisions along the way to guide our growth and development. One of these decisions takes effect today, January 1, 2011. For the past six months we have been in close cooperation with another global lean consulting firm whom we have respected highly for many years. We quickly realized that the two companies shared the same values, had similar long-term visions and complemented each other very well in terms of geographic locations, capabilities and industry experience. Key individuals within the two firms met in various parts of the world, we shared business opportunities, and we set an aggressive target to fully merge our two companies as one at the start of 2011. As of today, we are a new Gemba. Kaizen Institute was founded 25 years ago by Masaaki Imai, the author and professor who was the first to introduce Kaizen and Gemba Kaizen to the world in books of those names. As part of Kaizen Institute Consulting Group, the Gemba team will combine our forces to form a global team of nearly 300 people with operations in 30 countries. Driven by the mission to spread the true meaning of kaizen worldwide, my new company is the longest-running lean consultancy, has the deepest worldwide coverage and with the combined strengths of Gemba and Kaizen, will be the best. So this year I am entering a new gemba with new challenges and opportunities. My role will be similar to what it has been for Gemba Research, joining the global leadership team of Kaizen Institute Consulting Group to help guide its growth and development. The challenges will be to effectively merge and integrate a diverse team of professionals around the globe and to standardize and improve how we do what we do. Luckily, our name is now Kaizen so this should not be a problem. Different gemba, same kaizen. The more we studied and compared our businesses and saw opportunities to remove waste, stop losses and enhance both quality and scope of services to our clients, it became almost shocking. This must be what our clients experience. It will take some weeks for me to grasp our full potential. For example where Gemba Research has lacked a presence in the past in countries such as India and Russia, and becoming part of Kaizen Institute now brings the capability to deliver excellent service to our clients in these developing economies with strong needs for lean management. Our North American team joins forces with Kaizen Institute Lean Advisors, arguably the leader and pioneer in applying lean healthcare as well as lean government and service. The two companies combine our lean tours into one integrated offering, vastly expanding our network and ability to lead in-depth lean tours in Europe, Japan and other countries. Kaizen Institutes has developed a sophisticated three-tier Kaizen qualification training program which will accelerate the development of kaizen leaders as we roll it out worldwide. 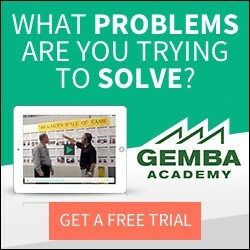 Gemba Academy delivers world class online training in lean and kaizen, and becoming part of Kaizen Institute allows us to expand our reach. There are many other ways in which the merger of these two companies will bring benefits to the lean community and the world in general as it pertains to the spreading of the understanding and practice of the true meaning of kaizen. On that, more in the coming days. As game-changing as we believe this union of Gemba Research and Kaizen Institute to be, we will strive to plan slowly and thoroughly and act decisively, turning the PDCA wheel many times. We will no doubt make mistakes along the way, but certainly not the same ones from the rich library of recent mistakes both companies have to draw from. We will listen closely to our customers to ensure continuity of service, manage change within our own organization to the best of our ability, and strive. During the next 12 months the Gemba website and other visible brand elements will gradually be changed to those of Kaizen Institute. In the short term the Gemba name will persist to ensure continuity. During this process we expect that the Gemba Research name will change to Kaizen Institute. We also expect that there will be lasting changes to Gemba will bring to Kaizen, both visible and more subtle ones. This blog will continue to be a sometimes whimsical personal platform for sharing thoughts on lean, kaizen and the Toyota Production System. Panta Rei means “everything changes” but this blog may not change so much. As a team member in Kaizen Institute, my hope is to share the ideas and voices of my new kaizen family also in this forum. I hope readers will forgive me if in 2011 my enthusiasm leads to self-promotion of Kaizen Institute, my new Gemba. I wish you all of the best and continuous improvement in work, play, life and love. It sounds like a lot of change for the better is happening in 2011 for you I wish you all the best. I know it will be a success. Jon – congratulations! I have had a lot of respect for your work and views and I’ve had a chance to meet a few Kaizen Institute people from around the world in the past year — also very impressed. Best wishes for the transition and everything that lies ahead. Happy New Year! Good luck with the new and exciting ventures. Hope to see you again soon. Happy New Year! I wish to let you know that for years your blogs have been inspirational, instructional, innovative and at times challenging. It has always been a a place to share thoughts, learn new thinking and get the best from all sorts of industry globally as seen from the lens of the TPS and the focus of learning kaizen from varied aspects of the business. With this new announcement, I feel that the excitement of yet another Gemba will bring to us and all other types of industry more collaboration and lessons learned. This goes to say that I have always admired your exploratory spirit in things. May this new Gemba shed more light to your to your lif elong pursuit of kaizen and continuous improvement. We expect greater things from you this 2011. Best of luck. Happy and inspiring New Year. I hope that your new venture will contribute to spreading Lean even more. Thanks for your inspiring blogs so far! Best of luck to you! Welcome to the KI global village, and suffice to say we’re all looking forward to great things in the year to come. Your wisdom and experience will be valued by us all and I will look forward to meeting with you in April. Many congratulations to you and your team. Onwards and upwards! Congrats! What an exciting new opportunity. I have learned a lot from you on your blog, I can only guess how many more people will get the privilege to learn from you now! Congratulations on your new adventure! I wish you much success. Congratulations! I look forward to the merger and the learnings that will be shared due to it! Jon;Congrats for you and the team. I’ve worked closely with Ron and Gemba Academy and am very excited for the possibilities of lean thinking being expanded through this new endeavor. Best of luck in what sounds like an exciting New Year. Happy new year….we at the Kaizen Institute – AIM – Africa, India, Middle East- welcome the new Gemba and look forward to some great value adding times ahead…value adding to clients, consultants and the world of Kaizen..
WOW! That’s some kaizen – or is it more of a kaikaku? Congratulations to you, Brad and your team and all the best going forward with your new challenges and opportunities. Tools are Worthless, but Tooling is Everything	Merry Christmas!